Will Looser Scoring Standards Help Americans Get Mortgages? FICO Blog / Risk & Compliance / Truth Squad: Will Looser Scoring Standards Help Millions More Americans Get Mortgages? Risk & Compliance Truth Squad: Will Looser Scoring Standards Help Millions More Americans Get Mortgages? Access to credit and the path to homeownership are important parts of the American way of life. That’s why it’s critical to understand what can be done to improve financial inclusion — and what won’t work. For months now, the three main US consumer reporting agencies – through their VantageScore business – have been claiming that millions of credit-starved Americans can get access to mortgages through the “innovation” of simply eliminating long-standing and essential minimum credit scoring criteria. This isn’t innovation, and it won’t help borrowers. It’s time to set the record straight. Claim: By loosening the minimum scoring criteria, VantageScore can give millions of currently unscoreable Americans a credit score, making them mortgage-ready. Truth: Scoring sparse and old data may give more Americans a score, but it won’t help those Americans who are actually seeking homeownership credit. Even worse, it locks millions of Americans into unfairly low scores. To begin, let’s look at why some people don’t have FICO® Scores. The answer is that there are FICO® Score minimum scoring criteria, which play a critical role in ensuring the robustness and accuracy of our credit scoring system, and by extension the soundness of lending decisions based on that system. The question is, if we were to loosen the FICO Score’s minimum scoring criteria, how many consumers would score 620 (a common lending threshold) or higher? And how many of those consumers would be in the market for a mortgage? To find out, we developed a research score that, like VantageScore, eliminates most of the time-tested FICO Score minimum scoring criteria. As a result, it can assign a score for the people with sparse credit files who are currently FICO unscorable. We aligned this score to the same 300-850 score range used by the FICO Score. 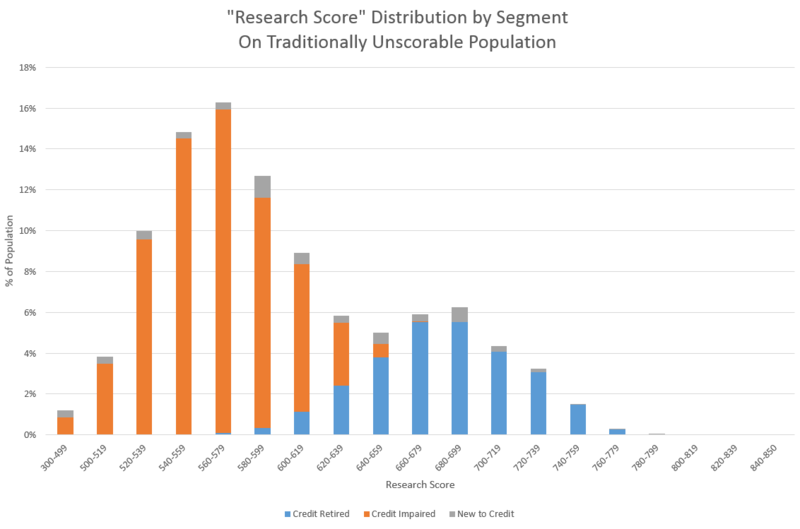 As shown in Figure 1, the largest of the unscorable segments is about 25 million people who have No Traditional Credit File whatsoever, and are therefore unreachable by any credit bureau score. Our research score couldn’t score these people, and neither could any other credit bureau score. Credit Retired: consumers with no recently active/updated accounts, and no historical signs of payment blemishes. These consumers skew older (median age = 71), and have voluntarily walked away from the use of credit accounts – they’ve paid it all back. Unsurprisingly, their appetite for new credit is extremely low; fewer than 5% of the Credit Retired population recently applied for credit. Credit Impaired: consumers with no recently active/updated accounts, and with historical signs of serious delinquency or other negative behavior on file (e.g., collections, public records). This segment comprises almost two-thirds of all unscorable accounts on file at the credit bureaus, and in many cases captures consumers who had a negative event and subsequently lost access to credit. As such, their traditional credit file is “frozen” at the consumer’s moment of financial distress. These consumers tend to be middle-aged (median age = 43), and show moderate interest in new credit (20-30% recently applied for credit). New to Credit: consumers with 1+ recently active/updated accounts, but with less than 6 months of credit history. These consumers skew young (median age = 24), and a typical borrower in this segment has recently opened their first credit card with a very low (<$1,000) credit limit. They are relatively credit hungry, with some 40% of this segment having recently applied for additional credit. As a group, all the unscorable people together score lower than the traditionally scorable cohort: The median score on this unscorable population is 585, roughly 130 points lower than the median FICO score of ~715. Only about 33% of this research population score 620 or higher, and the vast majority of those (80%) hail from the Credit Retired segment. If we focus on a score threshold of 680 or above, that figure jumps to almost 95%! Additionally, note the strong downward skew to the score distribution. The majority of the more than 18M consumers in our Credit Impaired segment — the people who had a negative financial event and either lost or never had access to traditional credit — would receive a score too low to qualify for credit. Even worse, because the Credit Impaired consumers lost all access to credit, they have no payment or account balance changes being reported to the consumer reporting agencies. Therefore, these consumers have no way to demonstrate their return to credit-worthiness. Many of these people have overcome, persevered, and recovered, and their recovery is not reflected in their frozen credit bureau file. Every fairly constructed credit scoring approach must give people the ability to demonstrate their return to creditworthiness – FICO’s approach to scoring more consumers using alternative data does, VantageScore’s approach does not. What does this show us? Despite claims by VantageScore, weakening the minimum scoring criteria will not empower millions of low-risk mortgage credit seekers. 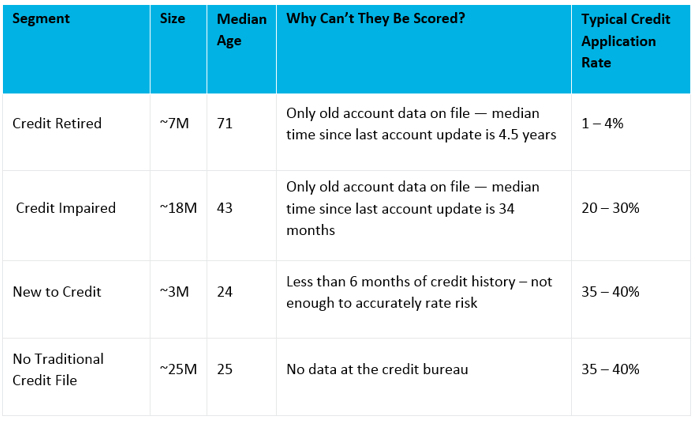 As articulated by the FICO white paper Can Alternative Data Expand Credit Access?, the responsible approach to scoring more consumers is to enhance sparse traditional credit files with rich data sources such as payment history on cable and telco accounts — data that is very rarely found in credit bureau records. This approach will help consumers on their financial journey into mainstream lending. 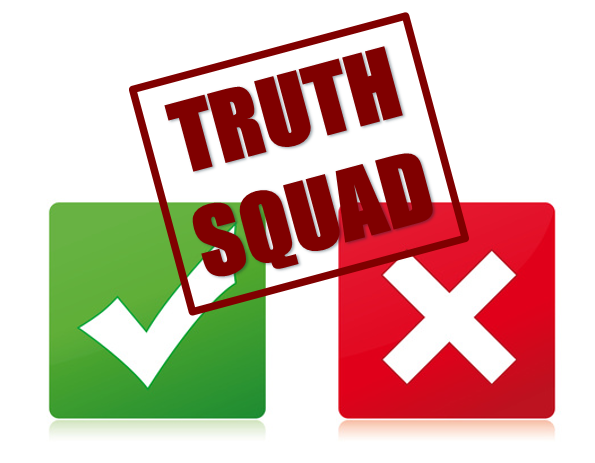 Stay tuned for the next post in our Truth Squad series where we will put more credit scoring claims to the test.